3-in-1 Snack & Discover Seat is rated 4.5 out of 5 by 46. Dimension (in) 22.5" x 22.5" x 21.6"
Rated 4 out of 5 by Cmelnyk from Super Cute I like this activity chair. It has lots to play with and entertain my baby. The tray isn't as easy as I'd like to get on and off, but it's not horrible. I'd recommend this for a snack tray. 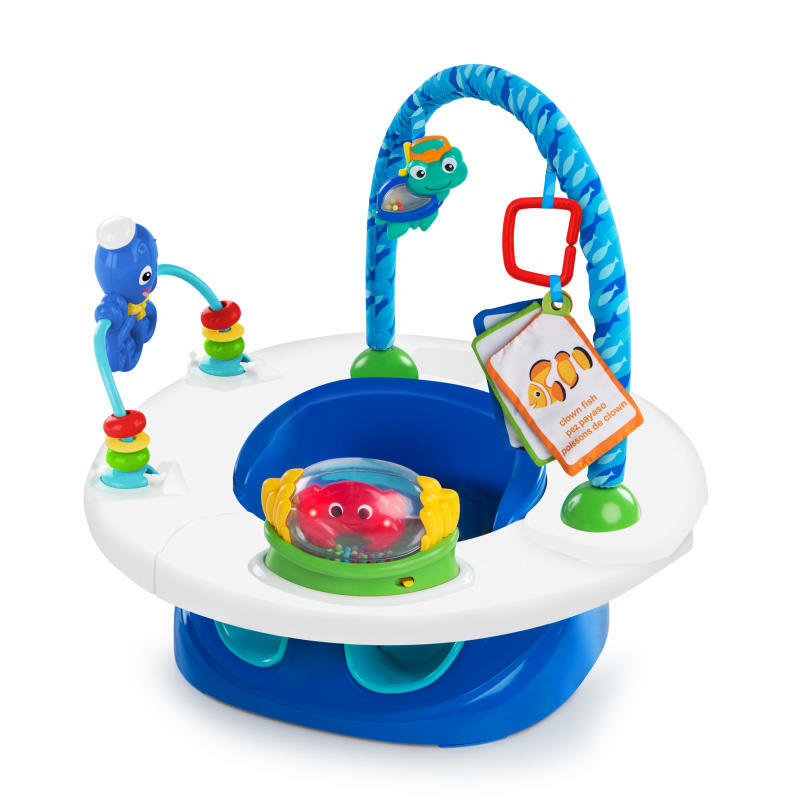 Rated 5 out of 5 by Adamiller from Love it My little One Just loves this 3in 1 & so do I. I love That i can set him in the floor in it and not worrying about him being high off the floor if I need to turn my back. Also it has so many fun things to play with to keep your little One occupied. Also when little man gets tired of setting in it I give him a snack and before you know it he said back to enjoying the fun toys again. Sure does give me a few minutes to get things done. Rated 5 out of 5 by mickeyismyhomeboy from Easy to use, great features! This is a perfect tool to engage my child when I am making dinner or folding laundry, etc.. We love the bright colors and supportive seat. Rated 5 out of 5 by Mbbickford from Great product! We haven't used this yet but are looking forward to the age we can! Rated 5 out of 5 by LDH2 from Everyone can use I love this product because from baby to toddler everyone can use it. The baby can play and learn to sit up. My two and theee year olds can use it as a booster. The versatility of this product is awesome!